The day I discovered chipotle powder was pretty life changing. We don’t use chipotle peppers a lot, and I would always end up with frozen little baggies of chipotle peppers in the freezer that would never get used. I would forget about them, and then I’d be cleaning out the freezer two years later and find a bunch. If you’re how often my freezer gets cleaned out… yes, it’s probably that pathetic of a situation. Help?? Crispy, and soft on the inside (thanks to the amazing Blushing Belles from The Little Potato Company!) with just enough spice. They would be perfect on their own, as a base for nachos, smothered in cheese sauce, dunked in ranch, or as a side dish alongside some Oven Fried Chicken or a burger (one of the Best Burgers perhaps??). 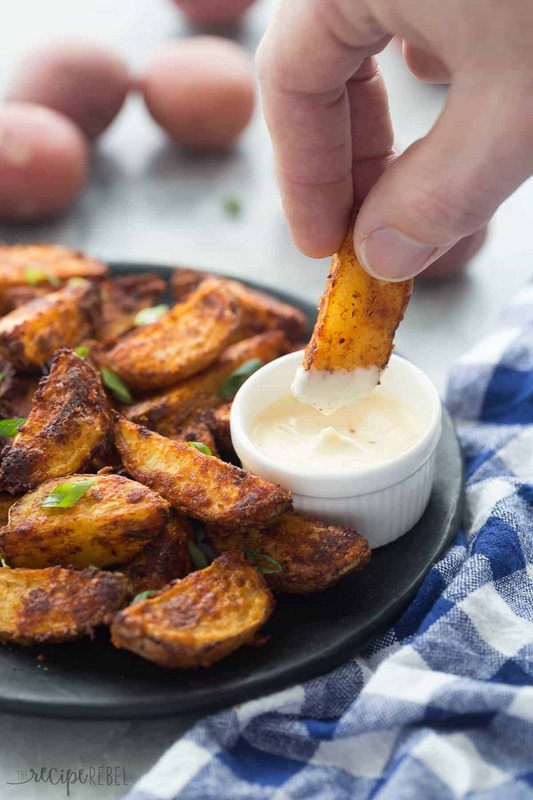 Potato wedges are something that I wasn’t making very often up until recently. In the past I used a recipe that involved soaking the potatoes first, then drying them, seasoning them, baking them, and it was just a really long process. So I just stopped. When I decided to give up on all the extra steps and just keep things simple, I was pleasantly surprised! They get nice and crispy (thanks to a high oven temperature) and the parchment makes flipping so easy (also, no clean up!). The chipotle powder adds a smoky, spicy flavor that we love! *This post is generously sponsored by The Little Potato Company — thank you for supporting brands that help me bring you alllll the crispy potato goodness! Quarter potatoes lengthwise and place in a large bowl. Add oil, chipotle pepper, Parmesan and seasoning salt and stir until evenly coated. Arrange in a single layer on baking sheet and bake for 20 minutes. Flip each wedge and bake another 5-10 minutes until golden on both sides and tender in the center. *I'm a bit of a wimp, and I would call these "quite spicy". If you want mild spice, reduce chipotle to ½-3/4 teaspoon. *Nutrition information is estimated and will vary depending on exact serving size, types and brands of products used. [br]*I’m a bit of a wimp, and I would call these “quite spicy”. If you want mild spice, reduce chipotle to 1/2-3/4 teaspoon. This giveaway is over. Thank you to everyone who entered! 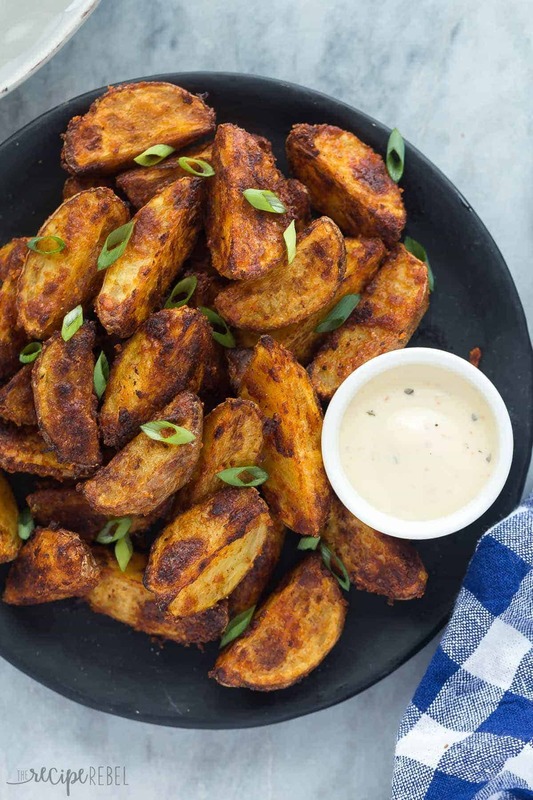 I am going to add the chipotle Parmesan potato wedges to the menu. They look wonderful. We live to take smaller potatoes and boil until almost done then pan fry in nitrate free bacon grease with various herbs. Sooooo good. These potatoes would work well for that. Yum! I’d enjoy the potatoes baked in the oven with cherry tomatoes. I love potatoes so much so I would try this recipe, fry some of these potatoes with breakfast, roast them and then cover them with cheese, bacon and sour cream and roast them next to a whole chicken stiffed with lemons. Mmmmm. Oh yum! That sounds like an incredible meal! I would roast them with olive oil and salt until they are nice and crispy. Little potatoes are my absolute favorite! I would make a loaded baked potato casserole! I’d make potato salad and boiled potatoes with lots of butter and fresh herbs. Now with the weather a little warmer, I think I would fire up the grill and have some of those little potatoes with some carrots, butter, salt and pepper in foil. MMM! I also saw so many yummy looking soups and stews on here that I would definitely use them in. My mouth is watering just thinking of it! I would mash these or roast them with some garlic butter. I would be making a lot of fries and hash browns with these. I would give this recipe a try. Also potato latkes for Sunday brunch. Yay for potatoes! I would make oven roasted herb potatoes, curry with various veggies and potatoes, and these chipotle potato wedges. Yum! 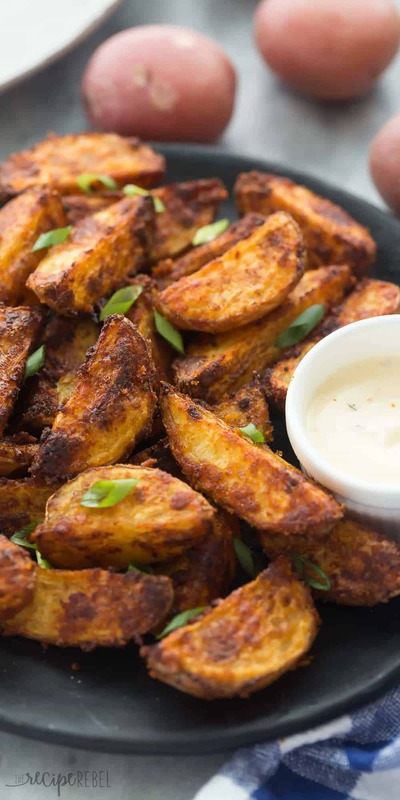 I would love to make your Potato Wedge recipe. I would also love to make a cheesy hash brown casserole. I would make herb roasted potatoes! Oh chipotle powder?! That sounds amazing! Like you, I don’t use chipotle peppers really, as my husband and I aren’t a fan of really spicy foods. But the powder option sounds great! Love the look of these wedges, Ashley! Definitely my kind of potato! Goodness those look and sound so good. I think I would try and make a garlic and herb scalloped potato dish with some parmesan cheese! I would love to roast them along with other Spring vegetables. I’ve always preferred plain fries, with salt of course, over the flavored ones. This recipe just might change my mind. I must give it a try. I’m doing the Whole30 right now and could totally use those potatoes in all kinds of dishes! I love them as sides with some ghee (clarified butter), smashed and roasted, or as a breakfast hash. Yum! We have potatoes with almost every dinner, fried, baked, mashed, in stews, soup. I could go on. I want to use my air fryer and use them in it once I find a recipe that sounds good. I would roast them in the oven with butter, garlic and onions.